JUNEAU — Alaska Gov. Bill Walker unveiled proposals for a new 3 percent statewide sales tax and two oil-tax increases as part of his latest deficit-reduction package, released Monday at the start of the Legislature's second special session of the year. In a letter to legislative leaders, Walker said he introduced the sales tax, which could generate $500 million annually, as an "alternative option" to the income tax he proposed earlier this year. The income tax would generate an estimated $200 million to help close the state's $3.2 billion budget deficit, but lawmakers dismissed the proposal and refused to advance it to the floor for a vote in both the House and Senate. Nonetheless, Walker introduced the same income-tax legislation again Monday to be considered during the special session, as well as a separate omnibus tax bill that increases existing charges on alcohol, cigarettes, commercial fishing, mining and motor fuel. The new oil tax measure from Walker is aimed largely at increasing state revenues from companies on the North Slope; it takes substantial steps beyond the oil tax bill approved by lawmakers last month that sharply reduces cash subsidies to companies operating in Cook Inlet. The new proposal would block all companies on the North Slope from receiving a tax credit tied to losses. The credit is projected to cost the state hundreds of millions of dollars if oil prices track with the Walker administration's forecast. A weaker version of that idea — one that would only have affected companies producing at least 15,000 barrels of oil daily — was approved earlier this year in a bipartisan House vote. But the Republican-led Senate rejected it, with members saying they didn't want to tinker with Alaska's existing tax regime. They also argued that the state's liability for credits wouldn't be as high as once projected because oil prices have risen from the depths they were in earlier. Walker's new proposal would not just affect the large companies that could suffer losses if they're investing at low prices; it also would shut off cash subsidies for smaller North Slope companies that lose money while they're trying to bring new fields online. A second part of Walker's new oil-tax legislation would set a minimum 5 percent gross tax on production if prices exceed $55 a barrel — a move projected to increase state revenue by about $50 million starting in 2020. Currently, the minimum tax is 4 percent; companies can use credits to drop their payments below that minimum threshold. The proposals, Walker said in a letter to legislative leaders, "build off the substantial work" done by lawmakers on oil-tax policy earlier this year. But, he added, the state's new oil-tax law "is simply not enough." "More work must be done to correct the state's unsustainable system of oil and gas production tax credits," Walker wrote. 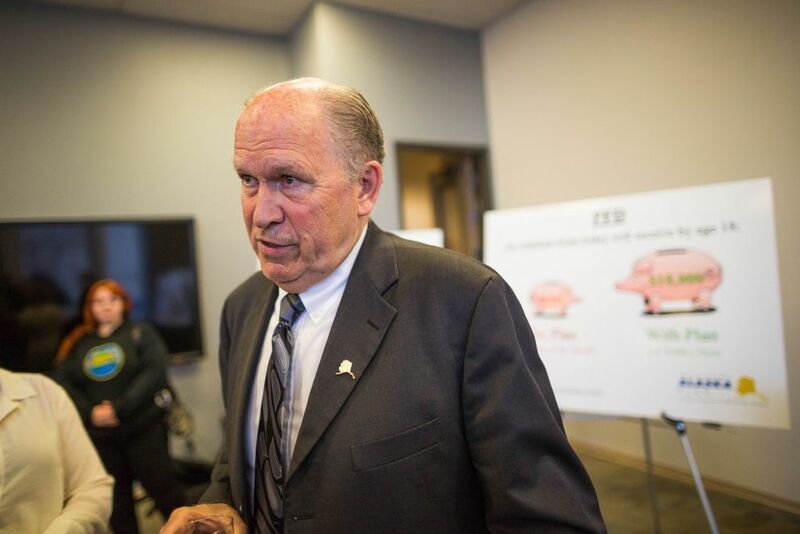 The fifth bill unveiled by Walker on Monday is the same proposal to increase state revenues by restructuring the Alaska Permanent Fund that the Senate passed and the House Finance Committee rejected during last month's special session. As the special session got underway in Juneau on Monday morning, Sen. Bill Wielechowski, D-Anchorage, asked for a special joint session of the House and Senate to override Walker's budget-bill vetoes, including one that reduces the dividend payout to Alaskans from the Permanent Fund. But Wielechowski's request, made on the floor of the Senate, was ruled out of order by the majority leader, Republican John Coghill of North Pole, who was sitting in for the absent Senate president, Kevin Meyer, R-Anchorage. Meyer said on his Facebook page that he was in Boston. While the governor generally controls the agenda of a special session that he calls, the Constitution also provides that the Legislature can use the session to override vetoes.